Eczema is a dry skin condition, which can range from been dry, itchy and red inflamed skin to severe cases of weeping, bleeding and crusting of the skin. Eczema cannot be cured but it can be controlled. Although eczema can affect people of all ages, however it affects 1 in 5 children. Most children who suffer from eczema usually outgrow the condition by adulthood. The cause of eczema is very complex, although it believed that people who suffer from eczema are born with over-reactive cells. The over-reactive cells are triggered by an irritation, the cells move towards the surface of the skin and cause the itching. When the skin becomes itchy, it is scratched and becomes inflamed and red, therefore causing eczema. It is also understood that over recent years there has been an increase of people suffering from eczema. This could be down to the increased exposure to allergens (such as dust mites), cleaning products, detergents etc. which are potentially harmful to the skin. There is evidence that eczema is hereditary but that is not always the case, as approximately 30% of the people who are diagnosed with eczema have no family history of the dry skin condition. Remember you are not alone if your baby or child suffers from eczema, there is help and support out there! We at Green Nippers have researched in depth into eczema and came across some very useful websites along the way. We thought we would share these websites with you, as they can offer you as a parent, advice and information about how to deal with baby eczema. 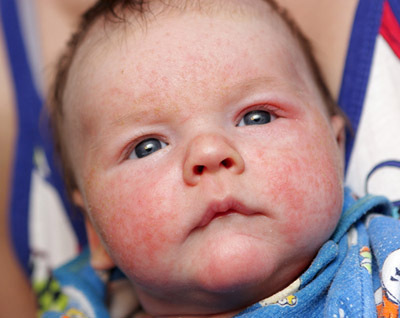 Itchy Baby provides and shares useful information between parents about baby eczema. The UK National Eczema Society provides people with helpful and practical advice about treating and managing eczema. Eczema Voice provides in depth advice and information about eczema. It is always great to get another parents perpective, visit Baby Eczema Help to learn about a parents experience who is dealing with eczema. The Eczema Association of Australasia Inc's (EAA) has some very useful information and advice. Keep Kids Healthy provides help and information about eczema or Atopic Dermatitis Treatments for Children. Here you can find dermatologists who deal with eczema. Please note: Green Nippers organic clothing is not only for babies who suffer with eczema! Our fun and colourful designs are popular with all babies; the organic and ethical side to our products ensures the babies delicate skin and gives you, the consumer peace of mind that their baby is wearing a chemical free and ethically made product.